COLUMBIA, SC (WBTW) – If you enjoy driving your golf cart during the day, you could soon be able to take a ride in it after dark. Representative Alan Clemmons of Myrtle Beach introduced a bill to the South Carolina State House could let golf cart owners in the state drive their carts at night. Under the bill, a golf cart has to be equipped with headlights and rear lights and can be stopped like a regular vehicle if one of those lights are out. 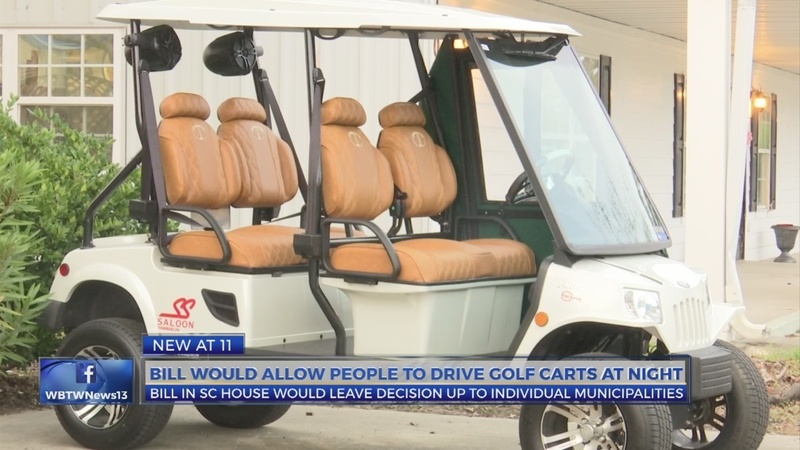 If the bill becomes law, it would let individual towns and cities like Myrtle Beach, North Myrtle Beach, and Surfside Beach to say yes or no on allowing those golf carts to be on the roads at night. Although the change might not effect drivers in the late daylight hours of summer, some residents like Surfside golf cart owner Pat Westmoreland are in favor of the bill. “In the summertime, we go out and ride our golf carts out to dinner, come back home and you’ve still got plenty of daylight so it’s legal. But, you can’t do it in the Winter, all Winter long,” said Westmoreland. Because cars and golf carts are so different, Myrtle Beach spokesperson Mark Kruea says giving nighttime privileges to golf carts could raise a number of safety issues. Westmoreland says it could be a good thing because some beach residents rely on their golf carts.